Spending part of last week inside the University of Luxembourg’s imposing steel skyscraper, situated next door to an even more imposing former steel manufacturing facility was a little eerie. Persistently gray and rainy skies rounded out the steely gray landscape. But the engaging group of historians at the conference The Way Out: Microhistories of Flight from Nazi Germany kept me in good spirits and the feverish work of the translators (English, French, German) kept me entertained whenever there was a dull moment. My presentation about the German Jewish citizenship experience went well and a few attendees even asked to be notified when my book A Place They Called Home comes out. The other 23 presentations at the conference focused on the pre- and post-war experiences of refugees in Luxembourg, the Netherlands, Portugal, Riga, the No Man’s Land, and many other places. I wasn’t sure how well my more contemporary focus on “the way back” through reclaimed German citizenship would fit into the conference theme. But I felt reassured when Bob Moore, the historian who gave the closing remarks, commented on how extensively the Holocaust has been studied and how important it is for micro-historians to couch their work in a broader framework. I’m not a micro-historian (or even a historian), but I agree that we can expand knowledge by studying choices made at the individual level, choices that can illuminate “the space of the possible.” Examining the personal histories of re-naturalized German citizens will, I hope, give insight into how descendants of Jewish families who fled the Nazis are forming new connections to contemporary German and European society. Sometimes the scattered pursuits of life come together to form a moment of connection, a moment that inspires and enlightens. This week my online acquaintance with a Holocaust survivor, my faculty position at CIEE’s Global Institute Berlin, and my desire to impart knowledge of the German Jewish heritage to my children and members of their generation came together in one such connecting moment. The occasion was Garry Fabian’s visit to Germany to speak about his book A Look Back Over My Shoulder. It wasn’t just Garry’s story of internment, survival, and reconciliation that made the evening special, or the fact that a second German edition of his book has just been released (Blick Zurück. Wie ein Stuttgarter Junge das KZ Theresienstadt überlebt hat). Garry travelled with his daughter Carole and grandson Seamus from Australia, giving our students the chance to hear one family’s Holocaust story from an intergenerational perspective. Garry is a true story teller whose easy-going speaking style invites us to face the past and learn about what we must never forget. He shared many vignettes from his childhood experiences as a refugee and concentration camp internee, but words were hardly necessary to demonstrate the strength of his spirit with his daughter and grandson at his side. Carole shared her second generation perspective, speaking of her grandmother’s silence and how she gained awareness of the plight of Melbourne’s Jewish refugees as she was growing up. Perched among the college students, my daughter Olivia, a high school senior, could relate to Seamus who spoke of how growing up Jewish and learning about the Holocaust were not as central to his identity as they were for his elders. Born in Stuttgart in 1934, Garry established a renewed connection to Germany over the course of many years, ultimately deciding to reclaim his citizenship in 2007. Carole and her children have also become German citizens. I’m honored that Garry has contributed his citizenship story for my book project, which may soon include a submission from his descendants as well. The quest to learn your family history in the aftermath of a genocidal era such as the Holocaust requires help from others. Survivors and their descendants seek answers from many sources, ranging from government officials to village historians. My own family research brought me into contact with many dedicated people in Hesse to whom I will always be grateful. Before moving to Germany, I was not aware that there is a formal way to honor “Germans who have made outstanding voluntary contributions to preserving the memory of their local Jewish communities.” It’s been done almost every year since 2000 through the Obermayer German Jewish History Awards. Long-term correspondence with one of my blog readers brought about the opportunity to attend the 2015 Obermayer Awards. He had written to me on numerous occasions about Jörg Kap’s dedicated efforts to commemorate the Jewish community that once lived in Arnstadt, Thuringia. He first nominated Jörg for the Obermayer Award in 2007, but it wasn’t until he was joined by fifteen other nominators from around the world this year, that the jury selected Jörg for this distinguished honor. 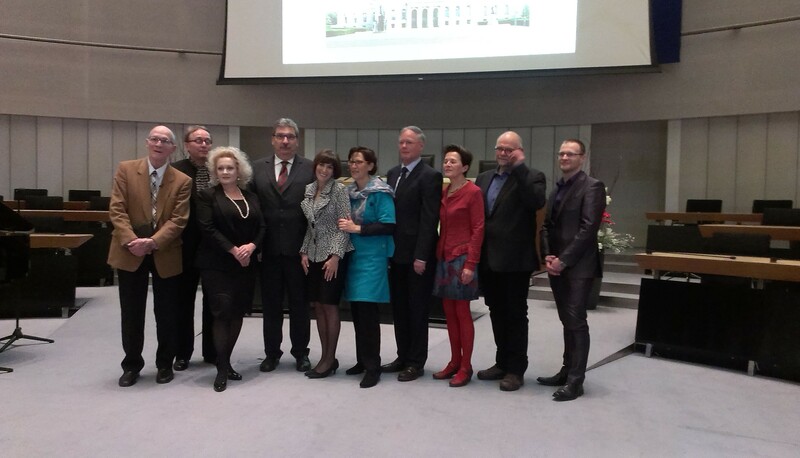 As Jörg Kaps presented his extensive efforts to preserve the memory of Arnstadt’s Jewish families, I had a sense of what his volunteer work meant to the descendant of one such family. Jörg Kaps and this year’s four other Obermayer Award winners are just some of the non-Jewish Germans who have helped to reclaim and rebuild a part of Germany’s history and culture that was all but obliterated. Their publications, restorations, art works, exhibits, tours, lectures, and more are a significant part of Germany’s ongoing reconciliation efforts. Lately, we hear a lot more from the media about threats to the future of Jewish life in Germany and the rest of Europe than we do about positive signs for the future. I’ve offered my own perspective on trends affecting Jewish life in Europe in a new article for Tikkun Daily: Jewish in Europe: Another Perspective. 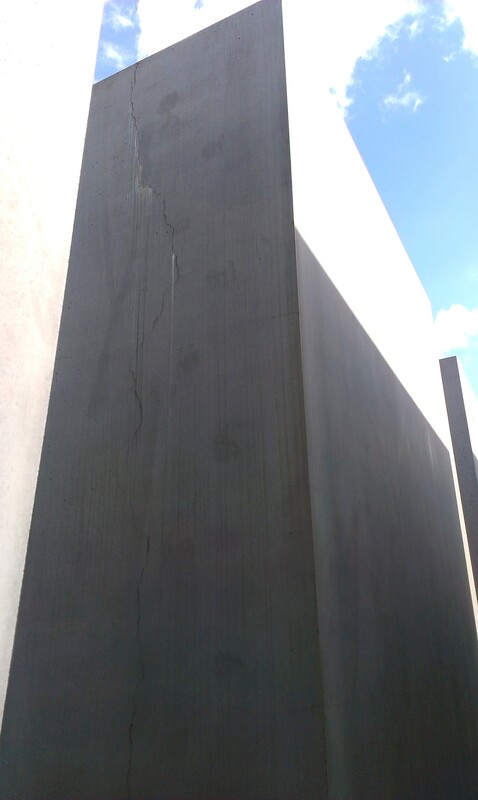 Some people are not disturbed by the cracks in the concrete blocks of Berlin’s Holocaust Memorial. They see the decay as part of a natural process that does not detract from the memorial’s powerful impact on millions of visitors. 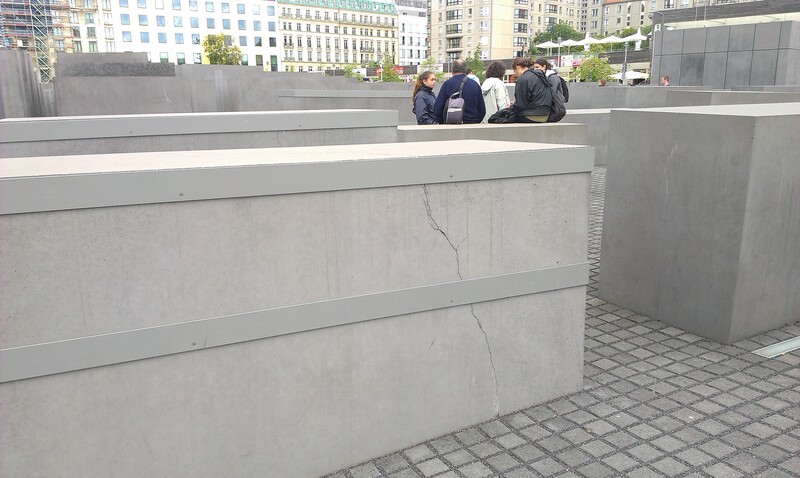 But how does the structural damage affect the visitor’s effort to find meaning in the 2,710 concrete slabs designed and built to memorialize the murdered Jews of Europe? An argument could be made that the cracks blend in with the otherwise plain concrete columns, but the steel braces around the most damaged slabs are another story. My impression is that they make the blocks look more like coffins and divert the mind from its real and imaginary journey through this cold and sterile expanse. As the decay continues and more steel collars are secured to hundreds of slabs, the memorial and its hefty maintenance costs are becoming an increasing embarrassment for the City of Berlin. The memorial won’t crumble any time soon and experts insist there is no threat to visitor safety. Whether the construction company or natural forces are to blame for the decay is an open question that is being investigated by a Berlin court. Its findings will comprise yet another chapter in the history of a landmark with an already troubled past. If you have not yet been to the memorial, it’s still well worth a visit. But you might want to come sooner rather than later. If you’re not a banker, you might not have much of a reason to visit Frankfurt am Main. But my sister and I just participated in the city’s “Visiting Program for Former Jewish Citizens and their Descendants.” No longer novices in the art of tracing our family history, we didn’t go to Frankfurt expecting to uncover any new nuggets of information about our father’s family. Instead, we made the trip to learn more about the region’s Jewish history, connect with the other German Jewish families, and spend time together. Our week of peering into the past with our fellow group members had many highlights, but the biggest highlight was the discovery that some of them were related to us. During the first night of the program, my sister thought she heard one of the participants mention the Wachenheimers from Biebesheim. But it wasn’t until the end of the week that we determined they were the very same Wachenheimers who also married into our own Adler family from Altwiedermus. While my father’s family fled to the U.S. in the 1930s, this branch of the Wachenheimer family fled to Argentina, and their descendants were members of our group. I think both of our families were emotionally stunned by this unanticipated connection. We’re now quite happy to embrace these newest members of our extended familia! As the descendants of former Jewish residents of both Frankfurt and Hamburg, my sister and I have had the opportunity to participate in both cities’ visiting programs (see Three Generations visit Hamburg). Hamburg is by far the more beautiful of the two cities, but our family’s roots in the Frankfurt area are much deeper. The many Frankfurt program officials, educators, researchers and Jewish community members who spent the last week with us are quite dedicated to helping Jewish families re-connect with their roots. This reconnection to the place where Anne Frank was born and where 30,000 Jewish residents lived before the Nazi era is an important part of the continuing efforts towards Holocaust reconciliation. One of the nice things about living in Berlin is that ordinary events tend to be held in extraordinary places. When I was asked by AVIVA-Berlin to give a brief presentation about my great-aunt Meta Adler who was a Holocaust victim, I had no idea I would be delivering my remarks in Rathaus Charlottenburg. Like many parts of Berlin, Charlottenburg was formerly an independent city in the Prussian province of Brandenburg. 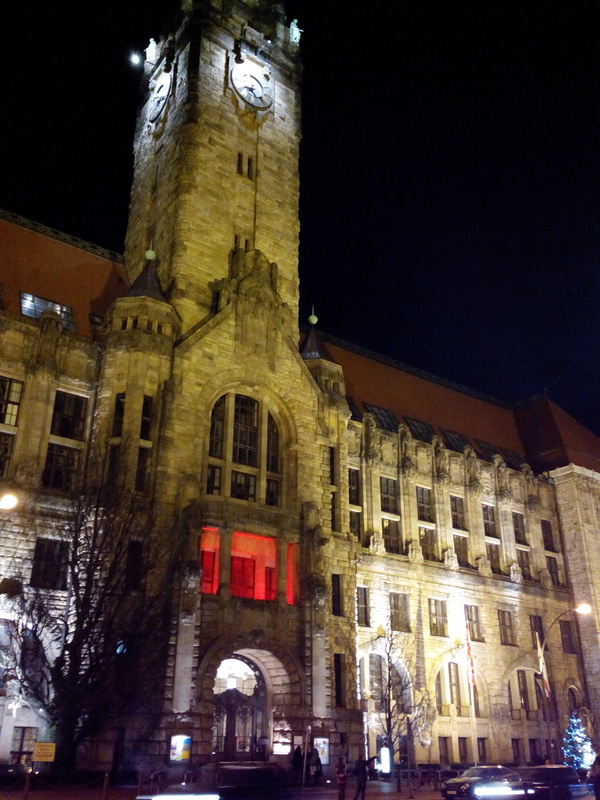 Construction of this ornate town hall took place while Meta was a young girl, but the building suffered severe damage during World War II. Rebuilt after the war, the Rathaus seemed a fitting place to share Meta’s story with a small audience that came to learn about AVIVA’s “Writing Girls” project. This year I didn’t uncover any family secrets on a par with my 2011 discovery of my aunt who was left behind when my father’s family fled Germany. Things seem to be in a state of harmony in my family for the time being. Of course that could change at the end of the month when I make a quick trip to visit my mother in her new assisted living home in California. But for now I feel a sense of peace as the year draws to a close and we are firmly settled back in Berlin. 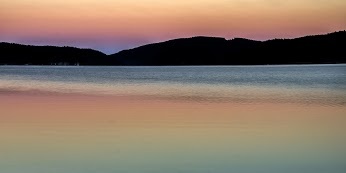 That sense of peace is reflected in this photo taken in the Black Forest by my friend and Fellow Traveler Michael Staubes. 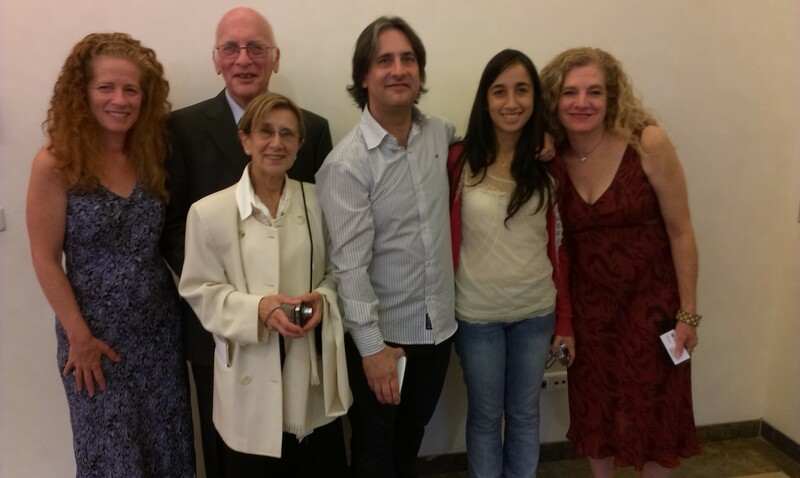 What is the role of the third generation in Holocaust remembrance and reconciliation? This is the question I am left with after reading Eva Hoffman’s thought-provoking book After Such Knowledge: Memory, History and the Legacy of the Holocaust. Hoffman tells us that the second generation is the hinge generation “in which received, transferred knowledge of events is transmuted into history, or into myth.” But as the connection to the Shoah becomes more tenuous for the grandchildren of survivors, and is less of a living connection, what is the third generation’s responsibility to grapple with this history and extract meaning from it? Some of us feel a stronger desire to connect with our past than others. 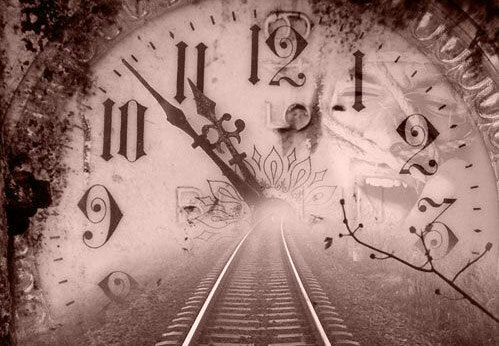 When my students were asked whether they would choose to time travel to the past or the future, most of them chose the future. I choose the past, still wanting to go back and learn more about my family’s pre-Holocaust history, even after nearly two years spent wading through the shadows of the past in Germany. I know there are many others like me. They even have their own organizations such as Grandchildren of Holocaust Survivors, which can be found on Facebook. There is also a growing body of literature on the third generation’s stories, reflections, and insights about the Shoah. But despite the desire of many grandchildren of survivors to receive and interpret the memories and narratives of their parents and grandparents, my sense is that such sentiments are not the norm. Most of my cousins showed little interest in my own family research and discoveries. For those who do have interest, delving into such a distant past is not an easy undertaking. But as Hoffman stresses, it is our distance from the past that can be useful in developing perspectives and understandings that are not available to the victims. Far from indulging in victimhood, the third generation can still play an important role in reconciliation. My hope is that the third generation will not be labeled the unhinged generation, the generation that has lost its connection to the past. Early in her book, Hoffman references an Israeli psychotherapist, Dina Wardi, who says that “in every survivor’s family, one child is chosen as a memorial candle….an instrument of commemoration, devotion, and mourning.” If this is the case for the second generation, I hope many of us who make up the third generation will continue to shine a light on our shared history in a way that will inform the present and benefit our future. I often think of the big canvas bag that I left with my friend Lyn just days ahead of our departure from Berlin. Packed with things I don’t really need, it sits in her closet as a symbol of my desire to return. 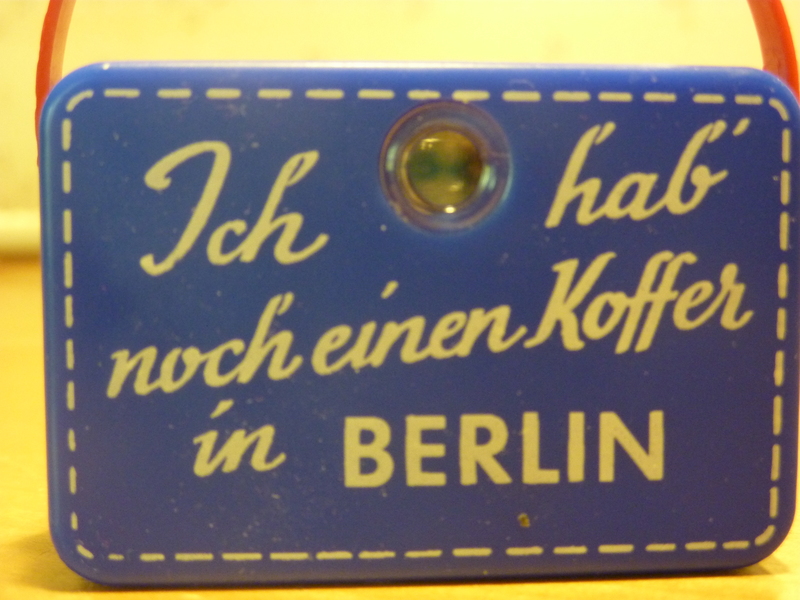 Besides my “Koffer,” a part of my heart and soul are still in Berlin. At least I’ve still got my German citizenship and a bank account there too. I’m not sure when I’ll be able to walk around the Schlachtensee or visit the Turkish market in Kreuzberg again, but I hope it will be soon. I’m biding my time by studying German, hunting through the grocery stores of Bozeman for dark whole grain bread, and immersing myself in a hectic semester of teaching at Montana State. I’m also looking forward to sharing my experiences with Americans who have an interest in modern Germany. My Montana Humanities program Germany’s Efforts to Confront the Legacy of the Holocaust is now available for groups in Montana and I’m making contact with Holocaust Education Centers to offer presentations on Jewish life in Germany today. With some of the recent tumultuous events in Germany, such as a regional court ruling against circumcision and the attack on a rabbi in our former district of Berlin, now is an especially important time for education and dialogue. While I’m disturbed by these events, they in no way diminish the significance of our German Jewish experiences or my commitment to chisel away at American attitudes that resist the reality of a changed Germany.